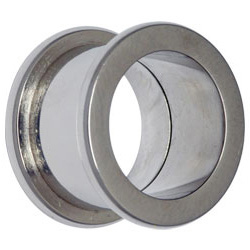 When it comes to stretched ear jewellery, steel flesh tunnels are a classic piece of kit. 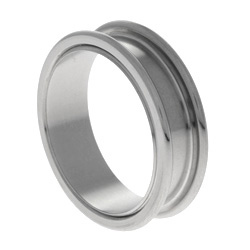 Whether your ears are five millimetres or fifty, surgical steel flesh tunnels are a great choice. Surgical steel is an excellent metal for flesh tunnels because it is very lightweight, easy to keep clean and comfortable to wear. This is especially important at large gauges and will keep your stretched ears feeling their best. Here at Body Jewellery Shop we have a huge range of steel flesh tunnels, but you can see some of our best-selling steel flesh tunnels below. Simple and stylish, these plain steel flesh tunnels are a must-have for anyone with stretched ears. On the left is our classic steel flesh tunnel with a threaded back. 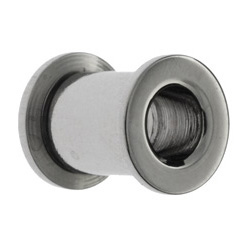 It is easy to insert and will stay securely in place once the back is screwed on. We also have a large gauge version, available in sizes above 20mm. In the middle is our small lip version, which is internally threaded. This means that this central tube has smooth sides, ideal for irritated or sensitive piercings. 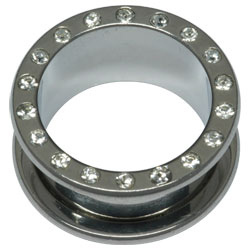 For something a little more eye-catching, check out our jewelled steel flesh tunnels. We have many different jewelled designs to choose from, but here are three of our classics. 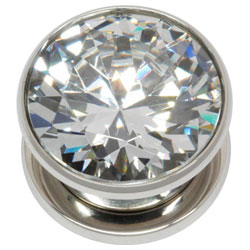 My favourite is the Brilliant Crystal Steel Flesh Tunnel, which features a supersized crystal. 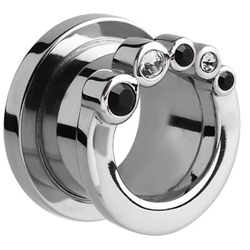 This tunnel makes a really glamorous statement – the ultimate way to show off your stretchings! This entry was posted in Stretching Jewellery, Surgical Steel Body Jewellery and tagged Ear Stretching Jewellery, Flesh Tunnels, Steel Flesh Tunnels, Surgical Steel Flesh Tunnels, Threaded Flesh Tunnels on June 4, 2014 by Piercing Guru.